“Midterm election results have gotten even more volatile in the last 25 years. Four out of the last six midterm elections have resulted in the House, the Senate or both changing parties. In the last six midterm elections, the only years in which the President’s party did not lose either their House or Senate Majority, were 1998 (during Clinton’s impeachment backlash) and 2002 (during the aftermath of 9/11)” [Cook Political Report]. The volatility happens because people keep voting for change and not getting it. “Minnesotans Don’t Think Franken Should Resign; Franken Remains Popular, Especially With Women” [Public Policy Polling]. But it was important to take “the high moral ground,” so under the bus with Franken immediately. The Vanity Fair Cave: “Vanity Fair sorry for suggesting Hillary Clinton ‘knit'” [BBC]. Vanity Fair is quite right to apologize. What Hillary Clinton ought to be doing is spattering the glass ceiling with the blood of faraway brown children. For shame, Vanity Fair! For shame! 1. I have some serious advice for @radhikajones, the brand new editor of @vanityfair, who took over from the legendary Graydon Carter and stepped immediately into a major scandal over a stupid sexist video. What Watson is doing, this time on the national stage, is just what Neera Tanden did a year ago when she got Matt Bruenig fired. If getting people fired for the views they express — I’m gonna say “modulo Nazis,” here — isn’t McCarthyism, I don’t know what is. I mean, come on. I guess there’s one thing liberals just aren’t liberal about, and that’s insulting royalty, eh? 2) It may be that one reason Clinton’s enforcers were so concerned to attack the video — which was, all things considered, rather gentle — was that so many of the participants in the video (one of whom, at least, was doxed) were young women; watching Clintonites fat-shaming one such women was a delicious irony. The idea that Clinton no longer appeals to young women would no doubt be deeply threatening to Clintonites and, apparently, needed to be dealt with at once, firmly. 3) I won’t go so far as to say “She’s running,” but Clinton is certainly maintaining an apparatus of media enforcement that would suggest she is. It also seems highly likely to me that Clinton has not even reached the “acceptance” stage in dealing with her loss in 2016, that the sycophants who surround her — whose livelihoods depend on her continued political prominence — are telling her that she could run again and win, and that she believes them. Of course, the split in the Democrat Party this would cause isn’t necessarily a bad thing. 4) You should really go poke through that thread if you want to get insight into the mindset of Clinton’s current, remaining supporters. It’s really hard for me to process this. It’s like watching one of those movies where humans turn into pod people. Which is a horrible trope, and now I’m dehumanizing (unless, of course, it’s all-too-human to turn into a pod person). Help! 5) Twitter failed technically — see the highlights — in serving the public that was hashing this issue out. 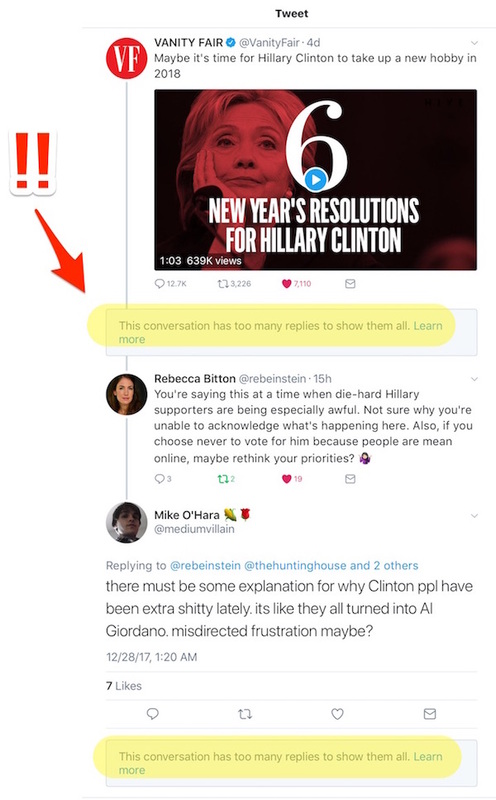 You’d think that a conversation with “too many replies’ would be important to represent. Do better, Jack. NOTE * I’ve seen the tweets, too slackish to find them. Read the thread, you’ll see plenty. “Donald Trump is not attacking the FBI, even as he attacks the FBI” [The Hill]. Meaning: Trump is attacking a “compromised” FBI leadership, not the rank and file, and the rank and file, not being that dumb, understands this. On “compromised,” this, after a list of oddities: “In the immortal words of Arsenio Hall, these are things that can fairly make a reasonable person go ‘Hmmm…'” A good rundown, worth a read, despite the rather uninformative headline. “IRS says only these 2018 property taxes can be prepaid in 2017” [MarketWatch]. “The IRS said property taxes that haven’t been assessed before 2018 won’t be deductible on 2017 tax returns. State and local law determines when property taxes are assessed and those dates vary by location, the IRS said.” Read for detail. “When billionaire Democratic donor Tom Steyer launched a digital petition drive to impeach President Donald Trump two months ago, some Democratic Party leaders dismissed it as an unhelpful vanity project — and even Steyer thought he’d top out at a million signatures” [Politico]. “But nearly 4 million digital signatures later, the philanthropist and environmental activist’s unlikely campaign has seized on an issue — impeaching Trump — that could become part of the Democratic mainstream in 2018.” Beware of squillionaires with bright ideas. If Steyer wants to blow the country apart, this is an excellent way to do it. Jobless Claims, week of December 23, 2017: “Initial jobless claims were unchanged at 245,000 in the December 23 week though, due to the holidays, an unusually large total of 15 states had to be estimated (this includes the territories of the Virgin Islands and also Puerto Rico where post-hurricane conditions are still disrupted” [Econoday]. “The large number of estimates clouds this report but earlier readings in December point to strong health for the labor market and to another favorable monthly employment report.” And: “This marks 143 consecutive weeks of initial claims below 300,000, the longest streak since 1970. The general trend of the 4 week rolling average is a slowing rate of improvement year-over-year which historically suggests a slowing economy” [Econintersect]. But not in the new normal? Retail and Wholesale Inventories, November 2017 (Preliminary): “Preliminary inventory data for November show builds for both retailers and especially wholesalers” [Econoday]. Since the holidays are coming, I assume? Chicago Purchasing Managers Index, December 2017: “Chicago’s PMI sample ends an enormously strong year at a 6-1/2 year high” [Econoday]. “One area not improving, however, is employment which is losing ground as members of the sample are having difficulty finding candidates. Lack of employment growth is of special note and has been cited by the Federal Reserve’s Beige Book as a risk to continued business expansion. Signs of overheating are evident in this report which includes respondents from Chicago’s manufacturing and non-manufacturing sectors.” If only there were some market-based solution for that! Housing: “Reis reported that the apartment vacancy rate was at 4.5% in Q4 2017, up from 4.4% in Q3, and up from 4.2% in Q4 2016. This is the highest vacancy rate since Q4 2012 (although the increase has been small). The vacancy rate peaked at 8.0% at the end of 2009, and bottomed at 4.1% in 2016” [Calculated Risk]. Banks: “Why Are Short Sellers Making Big Bets Against Major Banks?” [247 Wall Street]. “[W]hen short sellers make a play against these major banks, they are effectively betting for a downturn, and conversely when they back off they might be expecting a surge. Granted, some plays are directly against individual companies, like we saw with Wells Fargo early in 2017. The December 15 short interest data have been compared with the previous figures, and short interest in most of these selected bank stocks increased.” Those “selected bank stocks” being Bank of America (short interest up), JP Morgan Chase (up), Citigroup (up), Wells Fargo (up), Goldman Sachs (slightly up), Morgan Stanley (down). The Bezzle: “CVS Settles Overcharge Case” [Corrporate Crime Reporter]. “The pharmacy chain reached a $2.4 million settlement in May 2015 for allegedly engaging in misleading advertising by charging more than the advertised price for products and failing to give cash back on gift cards less than $10 as required by state law.” What a bunch of chisellers. I bet with a fine of that size, CVS netted out positive on the fraud. I wonder if the executives who devised it got a promotion? They certainly didn’t go to jail, as you are I would if we lifted a single item from CVS shelves. The Bezzle: “AI in 2018: Waiting for driverless cars to become a reality” [MarketWatch]. “Full, disruptive autonomy is likely further away than most may think, analysts at Evercore ISI said in a note earlier this year. It is a “science project,” currently, albeit one that “the greatest minds globally are tackling at a feverish pace,” the analysts said. The analysts have singled out Delphi and Nvidia as the top companies to target for investment in the space. The first truly driverless cars will likely be robo taxis, geofenced or physically confined to limited areas such as a campus, a business complex, or a downtown loop, until their use is more widespread and people start to get comfortable.” If your algorithm doesn’t work, control the parameters until it does. Programming 101. 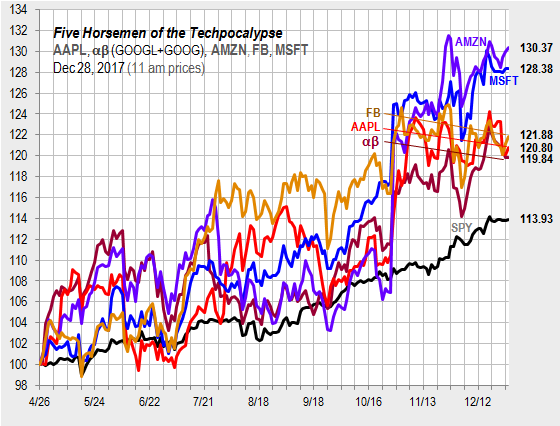 Five Horseman: “A small bounce in Apple in tepid pre-holiday trading leaves Alphabet in last place, with its near-20% gain since April 26th beating a near-14% gain in the S&P 500 tracker” [Hat tip, Jim Haygood]. Today’s Fear & Greed Index: 61 Greed (previous close: 61, Greed) [CNN]. One week ago: 68 (Greed). (0 is Extreme Fear; 100 is Extreme Greed. Last updated Dec 28 at 11:58am. This ad was (rarely for political ads, I must say) such a lovely moment. “[N]ews outlets are increasingly seen as partisan tools in the age of Trump, some conservatives are renewing opposition to CNN’s outsized presence in airports and other public spaces, especially taxpayer-subsidized venues” [RealClearInvestigations]. Can’t we just turn off the goddamned TVs in public spaces altogether? It’s degrading. My iPad’s screen is now routinely unresponsive at certain oft-tapped spots — for example, the place where Twitter’s email dialog comes up when I’m forwarding myself a link and holding it vertically — such that I have to rotate the iPad to find a spot that’s responsive. Now, part of that could just be a dirty screen, and I suppose there could be some degradation in the iPad’s surface coating, but it occurs to me that screen degradation would be very easy for Apple to simulate in software, and they have the means, motive, and opportunity to install such functionality, as the iPhone battery scandal shows. IOW, iOS is a phishing equilibrium. I hate to think that way, but it seems like the only way. Just spitballing here! “Subsistence Farmers in Puerto Rico Suffer Devastating Losses” [Daily Yonder]. The headline is overstated since there are no stats. That said: “Looking at the average age of the principal operator, Puerto Rican farmers were not too different from farmers on the mainland. The average age was 59 with 507 of the 13,159 principal operators under the age of 35. Of the households of the principal operators, 7,876 reported total income of less than $20,000. With such a large portion of Puerto Rican farmers at subsistence or near-subsistence levels of income, the impact of Maria on farm households must be devastating.” Yep. “Addiction Inc.” [New York Times]. “America’s Addiction Crisis ranks among the great epidemics of our age. Millions of people have fallen victim to painkiller abuse, alcoholism, the rise of meth and the revival of heroin. Sorrowful tales of death at a young age and of families torn apart have become a defining feature of the early 21st century American experience. In crisis, there is opportunity — and entrepreneurs have swept in. The industry of addiction treatment is haphazardly regulated, poorly understood and expanding at a rapid clip, bringing in $35 billion a year. Remarkably, this business is often conducted behind the closed doors of suburban homes scattered across the nation.” This is a four-part series; interestingly, in this part, a short seller is a major protagonist. “Hours-long power failure at Disneyland leaves some stranded on rides” [MarketWatch]. Disneyland?! Third World stuff. An objection to linear programming diets is that they are unrepresentative of ctual behavior and so of no use in setting a poverty line or for any other practical purpose. The second plane on which the paper operates is positive and aims to assess the predictive power of linear programming diets. I agree with the conventional view (Stigler 1945) that linear programming utterly fails to explain the diets in rich countries. It is a different story in developing countries, however. Linear programming does a reasonable job in explaining the total quantity of food and its distribution among broad categories. The linear programming diets are predominantly vegetarian. Grain bulks are very large. Small quantities of animal proteins and oil are also consumed. Linear programming usually predicts the predominant grain consumed in a country. It cannot predict the variety of fruits and vegetables that the poor eat, nor can it explain the universal consumption of small quantities of sugar nor eating associated with festivals. There is a small amount of “wiggle room” in which people have some space to consume a little sugar, favorite spices, or traditional foods at the expense of a healthy diet. But it is the nature of poverty that the latitude for these substitutions is limited, certainly in comparison to rich countries. What about certain areas in “rich countries”? “Neutrinos Suggest Solution to Mystery of Universe’s Existence” [Quanta]. “Scientists believe that the Big Bang should have produced equal amounts of matter and antimatter, which would imply that everything should have vanished fairly quickly. But it didn’t. A very small fraction of the original matter survived and went on to form the known universe. Researchers don’t know why.” An off-by-one error, probably. “Consciousness: Where Are Words?” [New York Review of Books]. Holy moley. This entry was posted in Guest Post, Water Cooler on December 28, 2017 by Lambert Strether. Comments now on. Hope everybody didn’t leave in a huff. I am so sorry. She is such a strong woman … so inspiring. There is so seldom accountability for “the authorities” and the crimes they commit, so seldom justice for the victims of those crimes. Erica Garner never shrank from doing the only thing she could do, the one thing that is often the hardest thing of all to do in our society — she refused to shut up. Inspiring is absolutely the right word. So sad. Someone who really saw the value in solidarity with a heterodox approach to fighting oppression. I won’t forget her. I fail to see the necessity for the NYPD to be in her room. But I have no information beyond the fact of their presence. The estimated cost of the underlying project — replacing the decrepit Route 95 North bridges and interchange in the center of the city while adding new travel lanes — has grown from $226.1 million to $342.9 million. The price tag to repair and expand Route 95 through downtown Providence has ballooned as Rhode Island looks to take advantage of President Donald Trump’s preference for public-private infrastructure partnerships. Why would the state seek a private partner and use private loans when its own borrowing costs are lower and it is about to see a new stream of bridge repair money from truck tolls? Glenn. 1. You are a traitor. 2. You are an online bully whose handlers use foreign bots to protect your abusive PsyOps. 3. Google Florence, CO. Less humid than Brazil. You might love it. Or not. But get ready. Uff da. I followed Garland for a while after finding Peter Klausler’s The American Cargo Cult outline curated at his site. He can write something interesting, but I suppose calling yourself a futurist is a tell. I’m old enough to remember when “lock her up” was the craziest idea ever. Clintonites see things differently, now, I guess. The full personnel and material cost of bombing a couple dozen $50 “enemy” pick up trucks with some old seized American tax payer funded machine guns on them in Syria. Would you rather have bridges here at home or know that we are “defeating terrorism” half way around the world? !Traditions! Stop It, You’re Billing Me! Have you tried a hammer? I second that notion. Sometimes things work better when you destroy them and use something else instead. Sorry. The iPad is essential to my photographic workflow, and to post-processing as well. Mine too! I just got a brand new one 4 months ago, and the screen goes all numb and insensitive. I thought I was safe with Apple. Hah! The epitaph of a generation. This only happened recently. The 11.x upgrade, IIRC, and the *.0 version was buggy. Apple used to be able to do software engineering. Remember “it just works”? I guess if I were a teenager with no priors — or somebody for whom a phone was their very first device — I’d think iOS was the greatest thing since sliced bread, and to be fair that is the market they are catering too. Funny. That’s what my mother always said when her children (4 boys) were using brute force – inappropriately, in her opinion. We must not have been too tough to raise; she just turned 100. Had mine for years. My fav and most used electronic gadget. I expect it will someday break down. Will get another when that sad day arrives. Whoever suggested that Hillary Clinton should take up knitting is insane. The thought of that psychotic monster having access to long, sharp implements is terrifying. I had the opposite reaction! I think everyone would be better off knowing how to knit…. the actual knitting and the preparation of picking patterns and yarns and colors…. it’s a hobby perfect for daydreaming. But I suspect “knitting” as a political insult comes from the DailyKos insult to the 2008 Hillary supporters being “Bitter Knitters” …. was it Kos himself who came up with that? Knitting teaches manual dexterity and mindfulness. Good things for all of us to know. Oh, anyone remember Roosevelt Grier, the guy who tackled RFK’s assassin in the Ambassador Hotel? Grier was a pro football player who took an off-season job on the RFK security detail. And he did needlepoint and macrame. Yes! I do remember…. I wish I had taken that lesson to heart back then… insteas of waiting till my late fifties to learn…..
Those of us who are tail-end lousy in the manual dexterity department (yours truly tests at the second percentile) regard activities like knitting with horror. Having to type, which I do slowly and inaccurately, is bad enough. At the risk of being off topic, I took typing way back in my high school days, at the risk of being the only guy in the class (and I was), because the wood shop class was the only other option for an elective and I hated woodwork (at the risk of sounding like so not being a guy.) Tried to do it and like it in my home basement where my father did all sorts of woodwork and I just couldn’t get into it. FWIW, I knew I would be using it for college, so I was totally fine with doing a typing class and I wasn’t bad at all. In about 1940 a girls gym teacher asked the boys gym class if two boys would volunteer to enter mixed doubles competition. Two friends looked at each other and said “yes!” A few days later as other boys derided the sissy sport, the volunteers said, “yes, just us and thirty girls in gym shorts.” Sixty years later the two still laughed about it, with each claiming to have had the idea first. My mother insisted that I take typing during middle school, sent me to a local secretarial school for it. Yes, that was odd, but I can still touch-type and that’s how I’m writing this. She’d seen my handwriting, figured it would help a lot in school, which it did. So I empathize with Yves about dexterity; mine’s better since I do such physical work, and pruning gives me quite a grip, but there were always things I had a hard time with. Fortunately, typing isn’t one of them. Didn’t sailors have to know how to knit and crochet on long voyages? They had to repair their socks. Knitting is only scorned because women do it. If men did it they would boast that they were better at it than women, as they used to about cooking and playing instruments. At the airport last week saw a woman with a cloth bag that said: “I knit so I won’t kill people”. I remember seeing my cousin doing a project that involved multiple needles (more than two), what looked like little plastic cubes, and a big diagram. So knitting looks to me like a complex data structure, and I would imagine it’s a good thing to keep the brain limber. Also a fertile field for metaphor, if I understood it well enough. For example, the current state of the union feels to me like an unraveling sweater, did one know which strand (is that the word? ), exactly, to pull on. Did not a Madame Defarge knit? Wasn’t she into politics? How could I have forgotten that?! OTOH, look up tricoteuse. Being a bitter knitter has upside potential as well. I recall that an iconic image of the French Revolution was of some old woman knitting next to the guillotine. HRC should be positively thrilled to be taking up knitting, compared with the fate that she so richly deserves. There are people who are “okay” with Hillary Clinton laughing about the killing of a world leader, who are “okay” with her calling young black men “super predators”, who are “okay” with the women she denigrated in order to defend her husband against charges of sexual abuse, and the list goes on. BUT, what angers them is Vanity Fair suggesting Hillary take up knitting???? Sid, That was Madame LaFarge sitting next to the guillotine. Thank you for all the wonderful replies, most entertaining! And of course you are all correct that knitting is a beautiful, creative activity that can be engaged in by anyone regardless of age or gender. Apparently the men in many fishing communities knitted, being used to intricate knotting work. My boys love “finger knitting” and I can easily see how they could make a fishing net (they have discussed that themselves). Once they get started, it keeps them completely occupied for 30-45 minutes at a time. Great activity for plane and car trips. Macrame used to be a great pastime in the 60s–easier for clutzes like me. They simply assumed she was a KNIT-WIT. if Dems win the House in 2018, then odds increase for a Trump re-election. Gridlock (and blaming Congress) will be the best thing that happens to Donald—Trump will have an excuse for accomplishing nothing in 2018. It’s a case of be careful what you wish for. just being realistic. And gridlock may be the best thing for the rest of us as well. At least it’s currently the best the two weevils have to offer. I’m also amazed at folks who think a “flipped Congress” will be able undo the many bad pieces of legislation passed under Trump’s rule. He will still be president from 2018-2020, and I don’t think any “blue wave” will be strong enough to overcome a presidential veto. What’s to stop Trump from happily signing stuff to overturn stuff, given his main interest is in “getting stuff done”? I think it might behoove us to bear in mind that his loyalty to the Republican Party is questionable, since every narcissist I’ve known had only one loyalty—to themselves. The only reason Trump and the GOP are viewed as two parts of a whole by the masses is because that’s what the 24/7/365 TRUMP!!! coverage by the media has been aimed at. And remember when it was pondered whether he’d back single-payer because it would guarantee he’d get re-elected? Trump wants to be admired. If a Democrat-owned Congress hands him stuff that will make that happen, I think, based on personal experience with his kind, that he’d be more than happy to sign it. Yup. I suppose most movers and shakers can only see Trump as an uppity nouveau riche. I, as a prole, remember groaning that he wasn’t just a flash in the pan back in the 80s. I suspect he’s looking forward to campaigning in the midterms. The legislation Trump has signed is all pro Upper Class legislation. Would he sign legislation repealing his pro Upper Class legislation? Would he like to tell his friends at Mar a Lago ” I just made you very very not so rich again.” . . . ? If the Berniecrats can purge the Catfood Democrats out of the Party, so that Berniecrats are the only crats left in the Party, then a Congressional Majority made up of Berniecrats ( if we can ever elect one) could send pro Lower Class bill after pro Lower Class bill to the President for his Veto. They could then make the point that it would take a Berniecratic President to sign Berniecratic legislation. So lets elect one. The Catfood Democrats would oppose any bill the Berniecrats support. Probably by sneaky underhanded methods in the dark. The question isn’t whether or not the blue wave is strong enough to overturn Trump’s policies. No, the question is does the blue wave want to overturn Trump’s policies. The so called tax reform, secretly loved by dems because donors, is not gridlock. And leave people UN-exposed to commercials for several minutes, maybe even verging upon an hour or two??? Hear, hear! Turn off those confounded TV sets in public places! I hate the ones at the gas pumps. Who thought we needed to watch TV as we pump gas? Oh, and the NYC taxis. Ugh. On the other hand, I did enjoy watching “Jeopardy” last night in a bar with other devotees. There was also a large pizza oven in the room which made the whole experience very “Hygge” as the Danes would say, on a frigid winter night. Very hyggelig (hygge is the noun). GAH. Yes, the TVs at gas pumps are really the worst. With Taxis, I am mostly able to turn those d**n things off, but not so lucky with gas pump TVs, which are usually super loud, as well. For someone who hasn’t owned a tv in years, and who assidulously avoids all TV “nooz” like the plague, those public tvs are torture, frankly. I don’t know what Hygge means, but I’ll try to listen for it as I watch Season 2 of the Danish/Swedish version of “The Bridge.” I find I’m picking out a few words here and there (both Swedish and Danish). I went to the ER late at night after I seriously cut my hand. The TV was blazing in the ER room. I requested the blamed thing be turned off……and the ER technician told me, “Wow, that is the first request of that nature.” I was shocked that people who are injured would like to listen to that crap. Awful. I routinely ask that a tv be turned off, or, in particular, changed away from the Fox channel when I’m in a public place with it blaring. E.g., car rental counter; breakfast area of a Hampton Inn. Since I like sports, I can usually request ESPN without folks realizing it’s really a tactic to get away from Fox. Of course if the sports are on Fox . . .
Good for you. That takes brass ones! That can’t be true. My dad has made that request every time we’ve taken my mom to ER. I bet it happens all the time! A friend in law enforcement here in the National Park went to FLETC (federal law enforcement training center) in Brunswick, Ga., and told me the the dozens of tv’s in the mess hall were always tuned to Fox news, w/o exception. Fox News . . . a Safe Space for Conservative Snowflakes. http://www.tvbgone.com This is a device touted as capable of turning off almost any TV remotely. The Bezzle: “CVS Settles Overcharge Case” [Corrporate Crime Reporter]. “The pharmacy chain reached a $2.4 million settlement in May 2015 for allegedly engaging in misleading advertising…. I went into my local CVS to buy 9v batteries for the smoke detector. They had their house brand at 2 for $9.99, with a big BOGOF sign (ie: 4 for $9.99). Right next to it was the same house brand 4 pack for $9.29. I took the 4 pack, but the register said it was $13.29 for the 4 pack. Several minutes of complaining got me the 4 pack for $9.29. How many people would have accepted that the deceptive lower price was a “mistake”, and paid out the higher price? Well we’ve known all along that none of these humans are really “Christians” as taught and lived by the Rabbi Jesus. Words are really not so different from sofas and armchairs. They are external objects that do things in the world and, like other objects, they produce effects in our brains and thus eventually, through us, in the world. The only real difference is that, when it comes to what we call thinking, words are an awful lot easier to juggle around and rearrange than bits of furniture. Bodhidharma about 1400 years ago. Buddhas of the past and future only talk about this mind. The mind is the Buddha, and the Buddha is the mind. Beyond the mind there’s no Buddha and beyond the Buddha there’s no mind. If you think there is a Buddha beyond the mind’, where is he? There’s no Buddha beyond the mind, so why envision one? You can’t know your real mind as long as you deceive yourself. As long as you’re enthralled by a lifeless form, you’re not free. If you don’t believe me, deceiving yourself won’t help. It’s not the Buddha’s fault. People, though, are deluded. They’re unaware that their own mind is the Buddha. Otherwise they wouldn’t look for a Buddha outside the mind. Or Husserl for that matter. Do students even read the basic texts any longer or do they just browse the Wikipedia? Or Wittgenstein, or Austin, or the Greek sophists, etc. etc. But so what? Just to show that I read more than you? The essay is the last part of a really instructive series. So you can read it all! Reminds me of when I was keen to take take PSYCH 501 Perceiving, Knowing, and Acting, described as a review of human systems thereof. It was no such thing. Just the history of esoteric academic American systems. I was crushed. I thought I was in graduate school, the place where we finally looked at and considered all the things we assumed away because it was “only” high school or “only” undergraduate. It was no. such. thing. Anyway, the text for that I haven’t thought of in a decade or more — can’t remember a single damn thing. No wait, it was dark green. OTOH, been listening to an audiobook of The Way of Zen, A. W. Watts, often 2-4 times daily, for going on 4 years now, on my 45 and 30 minute commutes to my old night job and new day job, respectively. Still hasn’t gotten old. tend to think of mind and spirit as more abstract than concrete. Again and most emphatically, the intention of Buddhist texts is an experience. Not a philosophically pretty, logically dictated system more to the liking of latter-day analysts. It’s a how-to. You’re supposed to actually experience something, not just read it. Or it’s just more of the same ol same ol that necessitated the how-to in the first place. Yes, it’s fun to laugh when the illiterates think they’ve discovered something. This happens too often though, because it seems nobody is required to take a philosophy course as part of basic undergrad foundations. Imagine you’re lying in bed planning to furnish a house you’ll soon be moving to in a distant town. What do you do? You start thinking about different items of furniture to figure out if they will go together in the space there. This would normally be explained by saying that you are imagining mental objects—representations in your head—and arranging them together in a mental space, another mental representation, again in your head. But in our previous conversation, we reached the conclusion that there are no “mental” objects—no thoughts, that is—separate from real objects. Simply, there is no need to introduce this new entity, thought, between body and object. When we say we are thinking, what we are actually doing is rearranging causal relations with past events, objects that we have encountered before, to see what happens when we combine them. We don’t need a mental sofa to put next to a mental armchair. We allow the sofas and armchairs encountered in our past to exert an effect in the present, in various combinations. Like a controlled dream. This sentence “We allow the sofas and armchairs encountered in our past to exert an effect in the present, in various combinations” is right but I wouldn’t characterize that as “a controlled dream.” And “rearranging causal relations with past events” is, well, not very clear. What the radical behaviorists, whom Manzotti seems barely aware of, would say—and far more clearly—is that, when we start thinking about those different objects, we are behaving covertly—inside our skin—in ways that are similar to how we behave when we move actual chairs and sofas around, even though the actual things may not be physically moved or may not even be present. (Having some environmental support such as a floor layout software makes the task even easier.) The images aren’t “stored” in the brain any more than when you look at an actual chair or sofa—neither the actual chair or sofa nor a “representation” is inside you. Whatever you’re doing when you imagine the chair or sofa is akin to what you do when they’re present. I read Manzotti’s explanations of his mind-object identity theory in these NYRB pieces and can only think of what BF Skinner said close to half a century ago: “the environment stays where it is and where it has always been—outside the body” [About Behaviorism, p. 81, italics in original]. I wish Manzotti were paying attention. The fact that it is now Democrats who are practicing McCarthyism leads one to think a snappy word to describe that fact might be useful. I offer the word ” democarthysm” or “DeMcCarthyism” or “demcCarthyism” or some other variation on that theme. Just a suggestion and an offer. It makes me think of that Marx quote, about how history repeats itself, first as a tragedy, then as a farce. McCarthyism was truly scary, what the Dems are doing now with regards to Russians under the bed reminds me of when my toddler cries when it’s bedtime. McFarcism? except that it’s more professionally engineered. just another bucket of bouncy balls dumped into our enclosure. The Democratic party was historically in existence all the way through McCarthyism. Remember all the folk songs about how hard and forcefully they fought against it? How do “electric trucks” cause rail to fail (won’t even try to puzzle out the “suicide” part? ?, except to note that it confirms an idiot is speaking). 3) “Rail” by it’s very nature doesn’t specify propulsion. If you can make batteries for a semi, you could make them for an engine (diesel electric replaced, by, um battery electric?). Of course why would you make a “battery-electric: when you can just run wires. Using 100yr old proven technology in use every day. And you don’t need any drivers at all really, that seems to be more a combo of fading union strength and, I expect, the realization by railroad execs that when you have a crash it’s good to have a human to blame. Anyway, we don’t need to move past #1. This is like inventing a board game and saying “so much for basketball!”. It really is stupid, and I think the guy is fading under the strain. And I’m the one who thinks electric trucks is going to be Tesla’s final “destination”, the cars will be curiosities like International Harvester’s High Wheelers. Which were good cars! The trolley systems were local, and so were destroyed. Excuse me, bought, buy big auto. Can’t we just turn off the goddamned TVs in public spaces altogether? It’s degrading. I have one of those. It worked rather well prior to the digital teevee era, but I’ve had no success with it since. Linear programming article reminds me of long ago classes, and makes me think that root vegetables, cabbages and such will be planted by our modern victory gardeners. No plans for more liver. As I review raised bed plans, I wonder who the enemy is, besides the local squirrels. My 2 brother-in-laws voted for the reign of error, and the family get together for the overdone biannual potlatch, was a summit of all our fears of sorts. Both are retired white guys with Big Gov pensions and they’ve frankly gone off the deep end. A mere mention of the NFL kneeling, brought forth an admission from one that he flies old glory and the Gadsden flag just below it on a high flagpole @ home, and both are lit up at night, so no need to ever bring them down until they get torn, withered or sunstroke, and once that occurs, he and his wife burn them in the fireplace. I didn’t even bother bringing up the Chief Executive, why fan the flames? and when asked if he ever goes deeper into sourcing and verification of tales told, he shrugged off the mere mention. Both seemed backed into a circle, ready to lash out at any mention of how wrong things have gone, and a frightened beast is also the most dangerous one when cornered, so innocuous small talk about nothing filled the void, a large one. granted he’s really bad, but can’t see blaming anybody trying to pick a lesser evil from what was on offer. George Wallace said in 1968 that there wasn’t a dime’s worth of difference between the two parties. Of course, he was the last person to mount a serious third-party challenge that produced electoral votes. Then Gore Vidal came to much the same conclusion (but for different reasons) in his political writings of his last decades. The Romans popularized the divide and conquer strategy for those they wanted to subjugate. It still works! Yet, why is this a revelation? Why so hard to see the reality of the situation? Very hard to detach from tribal loyalties, I’d suppose. What could possibly go wrong, Robby Mook? I am not seeing “fervor on the left,” because most genuine leftists know that silver-fox Mike Pence is even more pernicious than Trump. I keep wondering why the liberal-ish want to impeach Trump and have President Pence. Some have claimed that Pence is less of a loose cannon. But the Tartuffian Pence has God on his side. Who has to have a cannon then? Further, there is still some residue among the liberal-ish of plain constitutional ignorance. These are the people who didn’t know about the Electoral College till November 2017. These are the people who also put the idea out there that the election of 2017 was invalid, that the election of Trump can be voided, and that Miss-Runner-Up Clinton then automatically becomes president. A little constitutional problem: The states run the elections. The U.S. Constitution has no do-over article or section. Deploying weapons of mass distraction is less costly than burdening the political donor class with the onus of materially supporting the society from which they have so greatly benefited. Meanwhile, I’m thinking of getting my guillotine out of storage. But the Tartuffian Pence has God on his side. Who has to have a cannon then? According to his brother, quoted in an interview I read recently, he’s been in the employ of the Kochtopus his entire political career, which is essentially the only career he’s ever had. Yes, I’ve heard the “at least he’ll be polite,” or the “at least he’ll be more ‘Presidential'” from ignorant Democratic voters. It’s not just Democratic voters who so ignorant. In my experience, the vast majority of voters are ignorant and clueless about what’s really going on. It’s too bad. It’s especailly too bad that we often do not have ONE at least reasonably good choice when we go to the voting booth. And who is most to blame for that? Ah, yes, the party which ran its primary in such spectacularly opposite-the-party-name fashion. The “liberalish” want Trump impeached because – in my anecdotal experience (admittedly limited but I do have a broad range of friends) – most of these people are pretty ignorant politically and just got “woke” recently when Trump won. They ticked off at Trump – with good reason. But they are utterly clueless at how worthless, bought off, sold out, etc, the Big D party is. They still view Obama as this “wonderful man with a beautiful wife and two gorgeous daughters,” and they mostly think Clinton is, at worst, “much better” than Trump. Most voters – no matter how they vote – are pretty darn clueless about what’s going on, and that’s true of Tea Baggers and the “liberalish” alike. my anecdotal experience is similar…but i note that there have been a lot more cynical actual lib/progs/lefties(for lack of a better term, “berner’s”, perhaps? )…out in the hustings. a lot more than 2-3 years ago. The Clintonists seem to consist of 2 subspecies: true believers, and operatives of one kind or another(correct the record, or goptea troll farms). they are difficult to distinguish, but they have managed to break social media. It’s just no fun any more,lol. I suspise that some of it is more a function of psychology than of smarts…people just don’t want to know how fubar and terrible everything is…it’s too much. try mentioning…say…Operation Ajax or the Tuskegee Experiment or all the times our own government irradiated whole cities to see what would happen…let alone economic realities of the hoi polloi or the numerous ways we are screwed each day, now just part of the background. Folks get almost catatonic…or they lash out at the source of such offensive irritants. Read the NYT special, Addiction Inc. It’s the best thing I’ve read in a long time. Kudos to the NYT. Good investigative reporting here. Greetings & salutations Atlanta city pensioners, sorry we had to tomahawk chop your pension, as we invested your money elsewhere and it never ended up raining, so we got antsy & used the rainy day funds too. In lieu of previous benefits you received, now you’ll each receive 2 bleacher seat tickets to watch your exciting Atlanta Braves. “Donald Trump is not attacking the FBI, even as he attacks the FBI” [The Hill]. Meaning: Trump is attacking a “compromised” FBI leadership, not the rank and file, and the rank and file, not being that dumb, understands this. On “compromised,” this, after a list of oddities: “In the immortal words of Arsenio Hall, these are things that can fairly make a reasonable person go ‘Hmmm…’” A good rundown, worth a read, despite the rather uninformative headline. Then it’s discovered that a senior DOJ official, Bruce G. Ohr has been demoted due to concealing that he had met with those behind the infamous “dossier.” It was later learned that his wife held a position at the firm that compiled it, Fusion GPS. The Clinton campaign famously paid for the lurid details contained in the since widely discredited opposition research. And some — including Congressman Jim Jordan (R-Ohio) — have publically posited that the “dossier” was used to secure FISA warrants to then spy on the Trump campaign. I wasn’t aware of this Ohr guy, but if it is fair to ask about Trump family and confidants about lies in meetings with Russians (and I think it is) than it is fair to ask DoJ and FBI officials about how they came upon the dossier. AND “demoted?” I would think that is serious enough to warrant termination, if not prosecution….who gets to lie and who doesn’t? The WaPo reported on Jan 13, 2017 that Christopher Steele, who prepared the “dirty dossier” on Trump, assisted the FBI in 2010 with damning details about the FIFA soccer federation which led to convictions. Thus Steele had established credibility with the FBI from his past work. But the involvement of a DOJ official’s wife in preparing the Trump dossier, and the Clinton campaign (via two money laundering cutouts) in paying for it, suggests a whole different kettle of rotten fish. So far, the theory that the flawed Steele dossier was submitted to the FISA court to justify wiretapping the Trump campaign is merely a plausible assumption. To the frustration of Congressional investigators, details on the secret warrant application prepared by the FBI and signed off by Loretta Lynch have yet to be released. After all, Very Important Personages could be gravely embarrassed, if not incriminated. Nevertheless, if in fact the Steele dossier — a product of partisan opposition research — was used to obtain a wiretapping warrant against the opposing campaign, it will be a scandal bigger than Watergate. After all, while Nixon personally supervised a team of “plumbers” who burglarized a political opponent, never did it occur to Nixon to suborn the FBI, the DOJ and the judiciary into doing his criminal dirty work. But would such a poisonous notion enter the beautiful mind of Nixon’s protégé, the charming Hillary Milhous Clinton? I gotta say ‘meh’ on the analogy. FBI was still Hoover’s fiefdom, DoJ-Mitchell went to prison, Judiciary-Saturday night massacre, Cox, Bork. The only time I went to Disneyland (1987) the park also suffered a power outage that affected most (if not all) of the park. We had to walk out of the Space Mountain ride, which stopped (thankfully) pretty close to the entry after we had boarded. The sight of the inside of the ride with the emergency lights on really stuck with me for years. Yup, same here. My friends and I were glad that the ride failed, just because we got to see the mechanical marvel that it was. Borrows from….who? Who are these outside parties who can also create British Pounds? Why they’re gonna be borrowing Bitcoin of course! I read through the whole thing as well and it made me feel like I’ll be glad to toast this year out. Like last year and the one before (sigh). Who are these outside parties who can also create British Pounds? “Operation Bernhard was an exercise by Nazi Germany to forge British bank notes. The initial plan was to drop the notes over Britain to bring about a collapse of the British economy during the Second World War. The first phase was run from early 1940 by the Sicherheitsdienst (SD) under the title Unternehmen Andreas (Operation Andreas, Operation Andrew). The unit successfully duplicated the rag paper used by the British, produced near-identical engraving blocks and deduced the algorithm used to create the alpha-numeric serial code on each note. The unit closed in early 1942 after its head, Alfred Naujocks, fell out of favour with his superior officer, Reinhard Heydrich. Bloomberg’s weekly Consumer Comfort index popped nicely today, as did industrial materials prices. Unemployment claims rose slightly, but remained at historically low levels not seen since the 1970s. The Atlanta Fed projects solid 2.8% GDP growth in the current 4th quarter, confirming the upbeat message from Yardeni’s indicator. I appreciated a comment on the VF Twitter feed about the first woman to run for President. It was for the Equal Rights Party in 1872. Victoria Woodhull with Frederick Douglas as her running mate. I didn’t know about her. She and her sister sound like pistols. There’s a movie in there. But most of the commenters don’t seem to have any kind of historical perspective about HRC in the history of the struggle for equal rights and economic justice. Perplexing to me. Probably my psychological type. I always ask rabid Hillary supporters and their “need the first woman president” position if they would welcome Sarah Palin, Michelle Bachman or now, Betsy Duvos for that honor. Their blindness [and this includes a fair number of my friends and my adult daughter], astounds me. I have long noted that the form of feminism that is in vogue today has two interesting characteristics. One – it is mostly concerned with only the advancement of relatively rich, professional women. It is almost a class thing and the assumption seems to be that eventually equality will “trickle down” to their poorer sisters…maybe…one day…in the fullness of time. The second – the closing down of voices from black women. It may be only anecdotal but several times I have read black women complaining that they were shouted down and forced off forums for women not by men but by other women when they tried to voice their own concerns. From my perch, HRC has been concerned with the struggle for equal rights and economic justice alright but only within the context of the group that I have talked about about. The phrase the “glass ceiling” which she talked about often, when you really think about it, is blatantly referring only to those women in the upper stratosphere of executive levels and certainly not the average women struggling to make a living. Those were only needed when it came to times of elections. In a just society with full equality for women there would be so many talented women in office that HRC would never have been considered as being suitable to be anywhere near the levers of power. Thus for historical context, HRC’s rise has to be considered within the context of third-wave feminism and not that of equality nor even “liberty and justice for all”. I actually had a longer comment about the very thing you note. This whole “glass ceiling “ meme and the “Lean Forward” phrase is all about money. Hilary and Crawford (of Facebook) want to make sure that women make as much or more money than men. They want to haunt (and I choose this word because they are specters/ghosts/not human) the halls of power. That is the opposite of “feminism” as I understand it. Feminism as described by David Graeber is about priorities. It’s about putting the nurturing of humans and of Mother Earth first and the making of “stuff” second. Your comment is very wise. If we had nurtured many women then Hilary would have been way down the list of great women to run for President. Hey! When I decided to become “active’ in politics in 2004 and now realize how conned I was, Carol Mosley Braun ran for president with Kerry, Dean, Edwards, Biden, Gephardt… I remember thinking that she was the real grownup among all those men. If Hilary and Bill were true feminists and leftists, they would have supported her. But they didn’t. Because Hilary was to run in 2008 as the first female nominee. Hillary bots explain that to me. Explain where you were when a black woman was running. Explain. Your Mosley Brain reminder actually had me looking up Cynthia McKinney, who ran for President on the Green Party ticket in 2008. One who was also willing to question the 9/11 report and confront Israel about their treatment of Palestinians. Have to remind the Hillbots there was actually a credible female nominee before “her,” but she wasn’t neo-liberal enough for the Tiffany Glass Ceiling club. That is why some refer to Goldman-Sachs Feminism and the Tiffany Glass Ceiling. I was there back before the HRC campaign realized she needed to be shielded from cell phones because they have cameras. Hoo boy. Strictly theorizing, but I’m guessing society pathetically failed the Garner family twice. First through the murder of Eric, and second by regarding life long, dignified health care a privilege, not a right for Erica. Agreed. I hope the doctors in the house will pipe up, but I’ve never heard of a heart attack being triggered by asthma. And I wonder if we will ever learn enough from the family regarding how quickly she was treated once she had the heart attack. Her tragedy sounds as if it could have been avoided or even prevented with adequate care, starting with better treatment of her asthma. A terrible outcome for American and particularly for her children. I had a cousin who kissed his wife goodbye (she was sleeping in) sat down to put on his shoes and died. It turned out he had an enlarged heart and they thought that perhaps the stress of beding over to tie the shoes was too much for his heart. There just wasn’t enough room anymore. Maybe it wasn’t the asthma but the stresss of the asthma…..? I don’t remember ever being tested for an enlarged heart. Wpould it show up in a regular chest x-ray? I am sorry for the bizarre typos. I corrected several but missed many. I am not very competent on this virtual keyboard….. It would show up in any basic battery of cardiology tests in a specialist’s office. I went to one recently (in France, my heart is fine if anyone is wondering) and the doc covered everything in about 15 minutes, except for the stress test. I’ve got asthma too and I’ve been sternly warned to stick with the preventative treatment and check my peak flow if I have any chest tightness. It could be she was having a slow moving decrease in oxygen that put stress on the already weakened heart. Poor thing. That family can’t win. From what I’ve gathered, Ms. Garner had an enlarged heart, and suffered a previous heart attack following the birth of her baby. So, she was apparently already in precarious health. Further research suggests that the stress of trying to inhale sufficient oxygen can, over time, result in the heart enlarging. I’m not a doctor, nor do I play one on TV, though, so I’ll also be interested in hearing from real medicos. So from my reading the issue is a cardiac arrest, which for sure can be precipitated by a severe asthma attack. Lack of oxygen would be the trigger. Also I read that she’d had an enlarged heart and had an MI post-partum. People that have return of circulation/heart rhythm are put into coma/induced hypothermia to preserve neurological function. More severe symptoms than those of European descent (greater exposure to allergens cockroaches, mice, air pollutants in conjunction with genotype predispositions). Hospitalizations and deaths (asthma) 3 times higher in African Americans than whites. I think a case can be made that the medical industrial complex failed Erica Garner as it does so for all African Americans with chronic conditions. So, apartment vacancies are going up. Color me not surprised, if the glut of overpriced luxury units is the same else where as it is here in Austin. Developers flatten affordable housing to put up their soaring skyscrapers one after the other, as if they believe the 10-percenters they’re targeting are an endless market. Maybe they do. 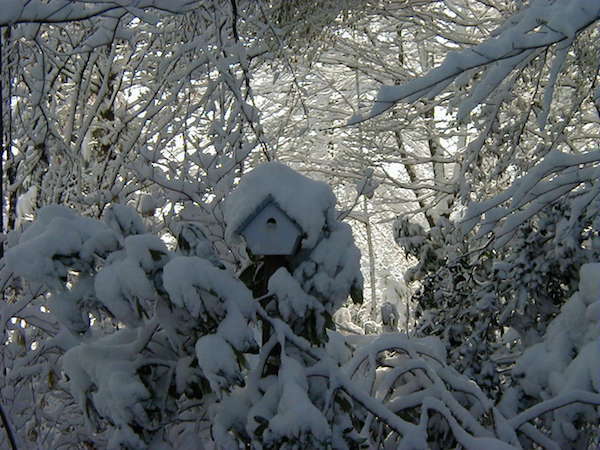 The winter so far in California has the same feel as the worst of the drought years: 2014-15. Virtually no snow to speak of in the higher climes. The smog was so hanky in L.A. from it not raining in a world of sundays, that I thought I was back in 1971, but then I realized the freeways ran smoothly back then, it just couldn’t be. Gonna do an overnight backpack trip up to Alta Peak (11,204) next week, normally forbidden fruit in the winter with a dozen feet of frozen white stuff en route, that we last tasted in January 2015. While a good chunk of the country is freezing their tuchus off, it’s in the 60’s and 70’s here, and bad news for pine trees from 3k to 7k that missed out on bark beetles last go round, it’s perfect conditions for the davids to take out the goliaths once again. Yes that 2014-15 weather pattern has hit us again here in south central Alaska. Warm and wet for us. The spruce aphids died from a cold winter last year. Should that not happen this winter. We could lose many more trees, and then the fire danger. Enjoy what you can while you can. I can’t take credit, all I do is copy the code that’s there. Perhaps YouTube did something good, for a change. Oh please, one should not criticize their betters. One might think some believe we live in a democracy! Perhaps universes form in pairs, positive and negative. No contact, no mutual destruction. Then again, maybe the theory is just wrong. It’s not like th eformative conditions are accessible. Always fun to read this stuff, but does anybody notice a confusion between “why” and “how”? “Science writers” seem to love to up the ante on the profundity of discoveries, even when the discoveries are already quite significant. But the article would be more accurate if every occurrence of “why” was replaced with “how”. Once we figure out the “how” of the universe’s tunneling into time, we will still have to aggregate with other information, and probably make some inferences, before we can claim to have approached, much less answered, the question of “why is all this happening in the first place”? But it is clear that the universe is tunneling through time (we’re figuring out how to try to figure out why). As the article mentions, the balance of forces at the point of the initial bang could/would/should have resulted in rapid entropy, the whole thing fizzling from mass/energy concentration to mass/energy dissipation linearly, or nearly so. But that didn’t happen; due to some disequilibrium resulting from the exact qualities of the initial “cosmic egg” and the bang event itself, some persistent low-entropy structures condensed, and the universe lasted much longer than it would have without such an asymmetry of constraints. Although the durations of each of these levels is always shorter than the previous, they are all more durable at scale, lasting longer than expected, tunneling deeper into time than they would if it were not for some fairly subtle side effects of the properties of the original egg->bang. The important thing about brains of higher [sic] organisms is that they allow the organism to make increasingly accurate estimates of what will happen next, in order to avoid disaster and find opportunity/advantage. Now we’re not just tunneling through time, we’re trying to steer! And all this is the direct consequence of some apparently quite subtle qualities present at the big bang (and presumably, prior to that). So here we are, talking about it. Unfortunately, or species fell down a rabbit hole called imagination, where we can conjure up immediately impossible things and keep fascinating and stimulating ourselves with them, to the greater part distracting us from the fact that we can’t actually live forever, unless we can pierce time’s rolling frontier. But why? What’s so compelling the larger context? I suggest that our own sense of identity may hold one of the keys, our desire to live on and on clearly in defiance of time itself. I was really looking forward to voting for Erica Garner.